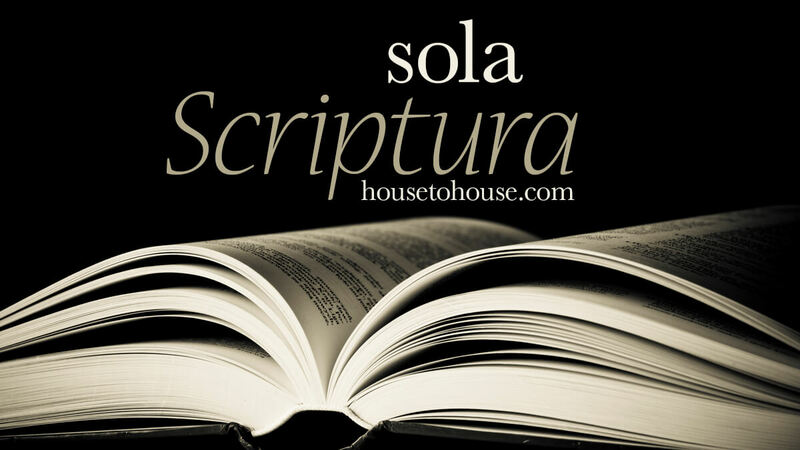 Sola Scriptura | ADULT CATECHESIS & CHRISTIAN RELIGIOUS LITERACY IN THE ROMAN CATHOLIC TRADITION: hosting ONLY True Christians!! !, or "How to think Catholic!!" “There’s a friar I’ve known for some time now who prays frequently for the unity of the Church, a matter which is clearly very close to his heart. I’ve often been moved by this. After all, St. Augustine says in his Rule that we are to be “of one heart and one mind, in God.” He was speaking about peaceableness among religious, but it’s also true in the broader realm of faith: our many hearts and minds, in all their happy diversity, should be as one in God, one in faith. Which brings us to sola Scriptura. What is it? In its strictest form, it’s the Protestant doctrine that Scripture is the only source and norm of Christian faith: “Scripture alone” has authority in matters of faith. In another form, both less fideistic and less true to its name, it’s the doctrine that Scripture is the final source and norm of Christian faith: there are other valid authorities, sure, but Scripture, and nothing else, tests and judges them. But sola Scriptura has many problems, to put it mildly. One of them is that at least one of its inescapable consequences is directly opposed to what Scripture—and in this case, Jesus himself—exhorts: “that they may be one even as we are one, I in them and you in me, that they may be perfectly one” (Jn 17:22–23). This prayer of our Lord, of course, has little to do with revelation itself and still less with where authority in matters of faith comes from. But it’s important to consider, because ultimately the doctrine of sola Scriptura necessarily excludes this unity that our Lord prayed for. This is because Scripture often doesn’t tell us how it ought to be interpreted, and, human nature being what it is, different people tend to arrive at incompatible interpretations which can’t all be true. The first form of sola Scriptura I mentioned above doesn’t appear to have anything like an adequate answer for this problem of multiple, personal interpretations. And the second form says that when there’s a conflict, we can consult other authorities, so long as Scripture has the final word. But even this only goes so far: some persons may accept the guidance of certain authorities, but other persons may reject them “on scriptural grounds.” So the problem persists, and sola Scriptura offers no real solution. Now Sacred Scripture is the word of God in written form—on this all Christians agree. But as Catholics, we have a yet broader notion of revelation: in addition to revealing himself in the inspired books of Scripture, God also revealed Himself in his word of truth entrusted to the apostles and handed on by them to their successors throughout history, even to the present day—this is what we call Tradition (which is itself described in Scripture: e.g., Mt 28:18–20, Mk 3:13–19, Mk 16:15, Acts 2:42, Acts 10:34–43, 1 Cor 15:1–11, 2 Thess 2:15, 2 Tim 2:1–2, 2 Pt 1:19–21). Hence we always read Sacred Scripture in light of Tradition, and we read Tradition in light of Scripture. Scripture and Tradition, together, are the supreme rule of the Church’s faith—not just Scripture alone, in isolation—because they’re two modes of the one sacred deposit of the word of God that has been entrusted to the Church. Not only that, but Scripture and Tradition both show us that Christ, in instituting the apostles as the foundation stones of the Church (Eph 2:19–20, Rev 21:14) and giving them authority to teach in His name, instituted an authoritative interpreter of divine revelation. This is what we call the Magisterium, the living teaching office of the Church. So what about that problem of interpretation? How do we deal with incompatible individual interpretations of Scripture? If it’s true that “God desires all men to be saved and to come to the knowledge of the truth” (1 Tim 2:4), then sola Scriptura can’t be true, because it doesn’t give us the tools to arrive—together, in unity—at that knowledge of the truth. Simply put, the Catholic Church’s more robust doctrine of divine revelation is the only way. Sometimes the full meaning of a passage of Sacred Scripture just isn’t apparent to us. Thankfully, God reveals Himself also in Tradition and has given the Magisterium authority to authentically interpret divine revelation, whether in written form (Scripture) or handed on verbally (Tradition). Of course, the idea here isn’t that we should approach the Bible like automatons, mindlessly complying with arbitrary directives from a distant, unseen authority—we should read Scripture and interpret it and hear God speaking to us through it! But we don’t have to go it alone: instead, keeping in mind the unity and coherence of the whole of Scripture and the unity and coherence of the truths of the faith, we look to Tradition (e.g., what the Fathers of the Church or the liturgy teach us about a passage of Scripture) and to the Magisterium (e.g., whether the Church has given an authoritative, authentic interpretation of a passage of Scripture), and we shape our reading accordingly. We can know what Scripture means because God Himself tells us—but He tells us not only in Scripture itself but also in Tradition and through the Magisterium. Each of the three needs the other two. But sola Scriptura protests. When Tradition and the Magisterium are invited to the discussion to help our understanding, sola Scriptura stands in the door, blocking their entrance. As a result, individual interpretation carries the day. And individual interpreters, with no authoritative guide other than Scripture itself, remain at odds with one another. And unity of belief is still not realized. Ecumenical dialogue often points out the important affirmations of faith that Catholics and Protestants share, and rightly so: we should rejoice that we believe together that Jesus Christ truly is the Lord, the incarnate Son of God; that by baptism we truly do become adopted children of God; that Sacred Scripture truly is the inspired word of God, set down in writing for the sake of our salvation; and so on. But we simply must recognize the disunity in our beliefs as well, because unless we recognize our disunity, we can’t pray for the unity that Christ Himself prayed for.